原曲:おてんば恋娘 / 東方紅魔郷　～ the Embodiment of Scarlet Devil. 原曲:ティアオイエツォン(withered leaf) / 東方妖々夢　～ Perfect Cherry Blossom. 原曲:もう歌しか聞こえない / 東方永夜抄　～ Imperishable Night. 原曲:厄神様の通り道 ～ Dark Road・運命のダークサイド / 東方風神録　～ Mountain of Faith. 原曲:緑眼のジェラシー / 東方地霊殿　～ Subterranean Animism. 原曲:万年置き傘にご注意を / 東方星蓮船　～ Undefined Fantastic Object. 原曲:門前の妖怪小娘 / 東方神霊廟　～ Ten Desires. 原曲:運河を行き交う人妖・柳の下のデュラハン / 東方輝針城　～ Double Dealing Character. 原曲:九月のパンプキン / 東方紺珠伝　～ Legacy of Lunatic Kingdom. 原曲:山奥のエンカウンター / 東方天空璋　～ Hidden Star in Four Seasons. 原曲:空中に沈む輝針城 / 東方輝針城～ Double Dealing Character. 原曲:秘神マターラ / 東方天空璋～ Hidden Star in Four Seasons. 原曲:輝く針の小人族　～ Little Princes / 東方輝針城　～ Double Dealing Character. 原曲:秘境のマーメイド ・ ミストレイク / 東方輝針城　～ Double Dealing Character. 原曲:亡き王女の為のセプテット / 東方紅魔郷　～～～ the Embodiment of Scarlet Devil. 原曲:幽雅に咲かせ、墨染の桜　～ Border of Life / 東方妖々夢　～ Perfect Cherry Blossom. 原曲:ヴォヤージュ1969 / 東方永夜抄　～ Imperishable Night. 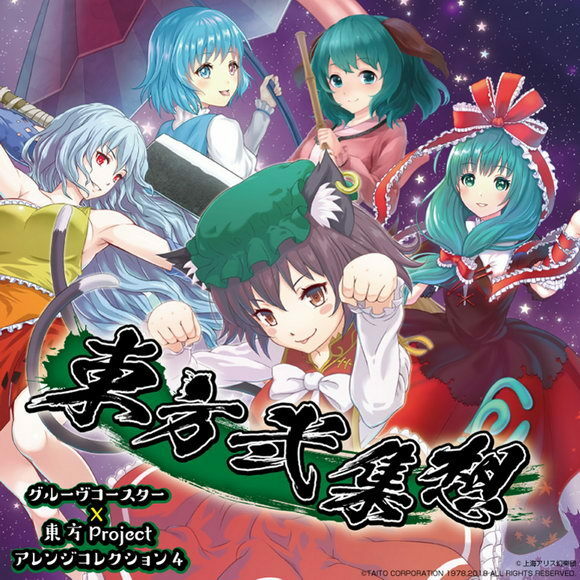 原曲:感情の摩天楼　～ Cosmic Mind / 東方星蓮船　～ Undefined Fantastic Object. 原曲:聖徳伝説　～ True Administrator / 東方神霊廟　～Ten Desires. 原曲:ピュアヒューリーズ　～ 心の在処 / 東方紺珠伝　～ Legacy of Lunatic Kingdom.